1. All children have equal access to education. 2. All children learn alongside their same-age peers. 3. The focus of education is on the child's abilities, not disabilities. 4. Children become accepting and understanding of one another's abilities, talents, personalities and needs. 5. Meaningful relationships and friendships develop as students spend quality time with one another. 6. Students develop confidence in their ability to interact with one another and the world around them. 7. 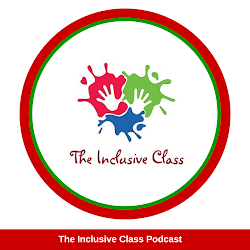 Teachers in inclusive schools are highly trained and skilled at delivering appropriate, student-centered curriculum through differentiated activities according to ability level. 8. 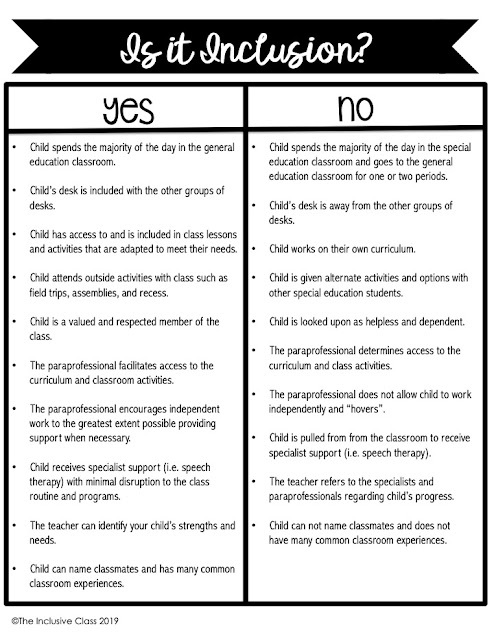 In addition to the classroom teacher, children with special needs are supported by special education teachers, paraprofessionals, and specialists such as Speech/Language Therapists. 9. Various resources and assistive technologies are available to students in inclusive schools in an effort to reach and teach all learners. 10. 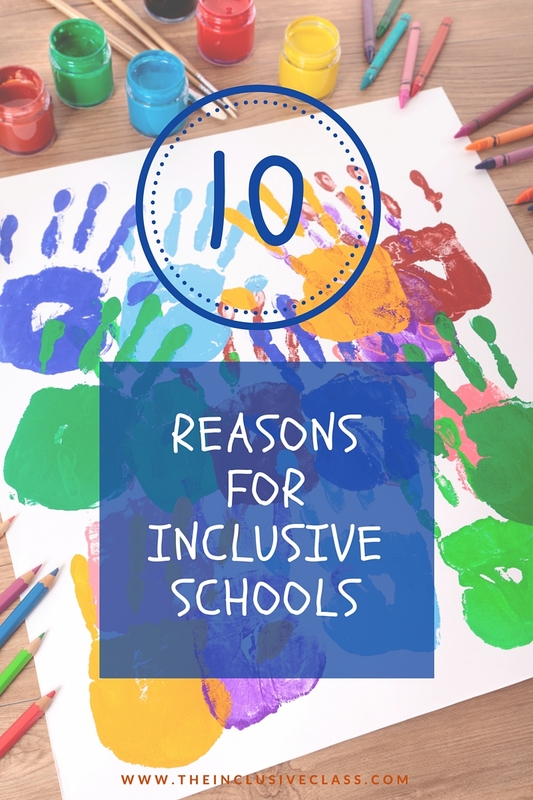 Inclusive schools value input and participation from the whole community, not just students. Everyone is welcome! Do you have any other reasons to add to this list? Ugh in theory all of this should work this way. However I see dd struggling and inclusion used as a messed up excuse to give her less support. That is wrong! All kids have access to education, should stress the access part. Access is not her sitting in a class of neurotypical peers feeling stressed because she can't access the curriculum. That is not inclusion but a recipe for failure. Ontario schools need to get with it and do inclusion right. Nope - doesn't sound like a truly inclusive setting at all! Too bad - I thought Ontario was well on their way to getting inclusion done right. Sounds like it is still a work in progress. Sadly, your daughter is having to be part of their growing pains. What do you think she needs for it to work? Can you have those elements written into her IEP? Well, this is what SHOULD happen but doesn't. Pricipals set the stage on how the kids are treated and if they don't talk to them, won't support them being in the classroom, and are afraid of the kids then this never works. Principals and higher management need to do the jobs of the special needs teachers and paras for at least two weeks before they are able to judge on how they are doing their job. Our specials teachers also need to do the jobs of the teachers and paras. They a lot of the time won't allow them in music class, art, and gym class due to they have to take the time to modify something for them and they don't want to do that. It's pertinent for the kids to be able to participate in art, music, and gym. Yet, our principals will allow teachers to segregate the kids and justify it by claiming special needs kid's behavior is the cause. The behavior isn't the problem if the child is given the chance to participate. You're right - the administration and support team (the entire school!) AND school district needs to all be on board with this philosophy, have the proper training and ability (ie. funds) to implement it. Inclusion can't happen in isolation - it's not a program, it's a belief system. And, so many school districts still don't take that approach! When it's done properly, inclusion is very successful. Hoping one day soon you will see that first-hand! Inclusion has happened in isolation in many, many classrooms throughout the USA. 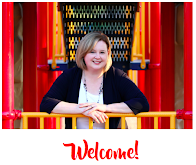 Actually, in the past quarter century, that is how we have learned inclusion benefits every student in a mainstream classroom as well as providing opportunities and support we never expected to find there for the student with an IEP. Aside from amazing academic accomplishments and social growth, the self-confidence and ambition that inclusive placements help flourish continue to be seen as all students involved move through the educational system. We cannot afford to wait until everyone in the community embraces civil rights or human rights to build more inclusive communities. We have already learned too much to wait until schools are more ready. In schools where inclusive placements have inadequate support, segregated special ed classrooms have inadequate supports. In most schools, an inadequate mainstream placement provides more opportunities for academic achievement, social interaction, self-discipline and self-awareness than what is considered an adequate special education placement.